In the period closely following the end of World War II there was a large increase in the number of men wishing to become Freemasons. So great was the surge of prospective brethren that the existing lodges were unable to accommodate them unless they held Emergency Meetings for that purpose. This practice was not favoured by Provincial Grand Lodge which preferred the formation of new lodges to cope with the influx. Our lodge was formed as a result of this policy. It was decided that a new lodge would be formed, that it would meet in Swansea and that it would bear the name of the Provincial Grand Master, RWBro. R.P. St John Charles. Reginald Pendrill St. John Charles was a solicitor in Neath. His father, WBro. Henry Pendrill Charles, also a solicitor and eminent Freemason was Deputy Prov.GM from 1915 to 1925. Henry had already given his name to Lodge No 3769 which was consecrated in 1916 and meets in Caerphilly. The naming of one lodge after an eminent mason and another after his equally eminent son is a permanent reminder to us all of the invaluable contribution these brethren made to the Craft. Every petition to form a new lodge requires the support of a duly warranted existing lodge. This support was readily given by the Indefatigable Lodge, No.237 in February 1947 and a warrant granted on the 5 March 1947. The Indefatigable Lodge has been regarded as our ‘Mother Lodge’ ever since and we regularly exchange lodge visits. The Consecration quickly followed in the Masonic Temple on Monday 9 June 1947, followed by a banquet in the Connaught which was attended by over 200 Freemasons. This was possible because the ground floor which had been requisitioned by the War Department in 1941 for use by the newly arrived American Forces was derequisitioned in 1946. The Consecrating Officer was R.P.St John Charles who led a team of twelve Consecrating Officers. The first Master of the Lodge was W.Bro. T.L.Jenkins who was installed by the Deputy Provincial Grand Master V.W. Bro. Edgar John Rutter. RP St John Charles took a very keen interest in his new lodge, helping with his wide experience and knowledge, to shape our early years. He came to our lodge meetings where he mingled with the brethren irrespective of rank chatting in his affable and courteous manner. Some brethren were invited to visit him and Mrs Charles at their home in Porthcawl. These visits developed into annual events eagerly anticipated by those privileged to attend and greatly enjoyed by them. It became customary for the ProvGM, to record a message for the lodge to be played at a future meeting. A tape-recorder was used for this purpose and a cine-camera, equipment then at the fore-front of audio visual technology, provided by WBro. Leslie M Rees and operated by Bro George Wallace Davies. Sadly the tape recordings have gone astray but one of the silent cine-films is still available. Bro.George Wallace Davies was the deputy City Librarian and made a very knowledgeable duo in the lodge with Bro. Ralph Wishart. Ralph owned a book shop near High Street Station later re-located to Dilwyn Street. His fame spread nationwide, because there were very few undergraduates at Swansea University, who were unaware, or had not made use of the expertise available from “Ralph the Books”. Always bearing in mind the need to live up to the name of RP St John Charles, the lodge flourished for many years, initiating a steady flow of six candidates each year. In 1977, the peak year, there were 118 members, but as Freemasonry in general numbers have declined and today subscribing members and honorary members total one third of that number. Despite the reduction in numbers, the quality of our Lodge has been maintained and we are noted throughout the Province for producing degree ceremonies of impressive standard. Our success is due to the hard, but hugely enjoyable, work of the Lodge of Instruction which took its present form as far back as 1955, when Reginald Watson who was the third Master of the Lodge became preceptor, his patient coaxing and coaching style keeping everyone happy set a pattern which has survived to the present day and is used W.Bro.Stuart Seabourne, our current preceptor, with outstanding results. No history of the RP St John Charles Lodge would be complete without reference to the charitable ethos of the lodge. This is probably due to the foresight of the founders who selected as our motto – “Date et Dabitur Vobis”, translated as “Give and it shall be given to you”. The Lodge also has an unofficial motto “No one needs a smile as much as he who has none to give”. This embodies the spirit in which we greet our visitors and ensures we are always well supported by members of other Lodges, who always seem to leave in happy and contented frame of mind. The lodge was honoured on the 17th/February/2011 to host the Installation of W.Bro. Jeffrey Parry Thomas as Assistant Provincial Grand Master. The meticulous planning of the occasion by Lodge Secretary W.Bro. J. Colin Bunyan was thrown into turmoil, when just as the procession was about to enter the Temple, the organ broke down. The day was saved by some of our younger members, having the strength of Samson, carried the electric organ from the Connaught Hall upstairs to the Temple allowing the Ceremony to proceed. This Prompted the Provincial Grand Master R.W. Bro. Sir Norman Lloyd- Edwards, who carried out the Ceremony, to comment this was the first time he had witnessed an organ transplant in a Masonic Lodge. Support for local charities has in recent years been concentrated on fundraising at the Christmas lodge. This has enabled us to assist local charities, including the provision of a special wheelchair needed by the Children’s Ward of a local hospital and regular donations to the Air Ambulance, local Hospitals and the PDSA. Fortunately the members of the RP St.John Charles Lodge have the ability and self-assurance to meet the future of Freemasonry with confidence and optimism and during the first fifty years of our existence as a lodge we have steadily progressed in a period of stability, but advanced warnings of change have been heard during more recent years and we know that even greater changes lie ahead which will affect the whole of Freemasonry and although our story forms only a tiny part in the long history of ‘Ancient Freemasonry’ we will have our own small contribution to make in the exciting times which lie ahead. Finally it was always the wish of Reginald Pendrill St. John Charles that the name of the Lodge should not be abbreviated to the R.P.Sinjohn Charles Lodge and we request that his wishes be honoured and the “R.P. 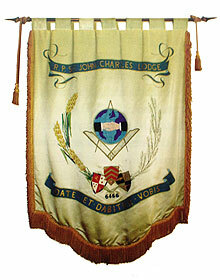 St. John Charles Lodge” is remembered as such until time immemorial. Compiled by W.Bro.Stuart Seabourne PPrJGW.